I have an old test rig (hydraulic cylinder applies pressure to a crank in sawtooth pattern) project written in gx developer for the Q03 plc. 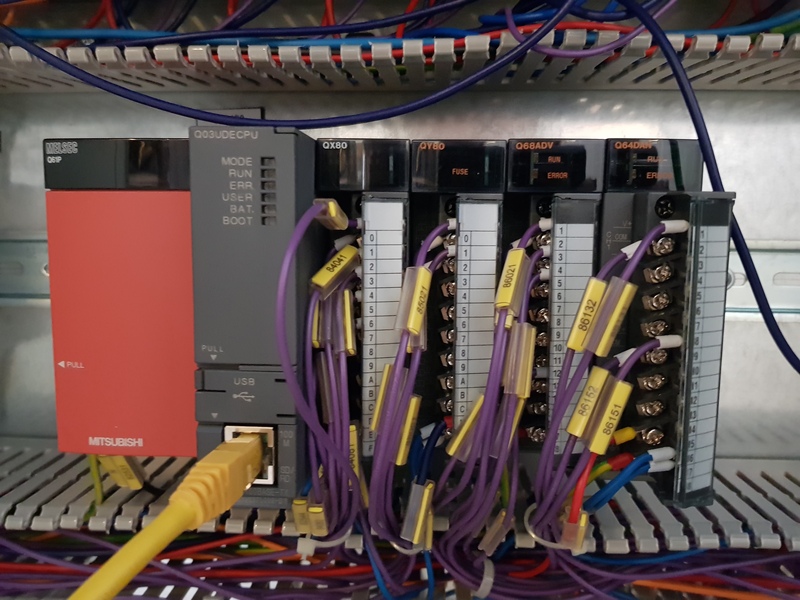 To this plc is connected a 1041 beijer panel, I have uploaded the project to E-designer. I am rewriting the sequence code because a new but similar test is prepared. Have a PID-block in gx works 2 (not in a simple project sadly) i would like to import and use in gx developer. This is causing me some trouble though. Can anyone tell me how to get the PID-blocks from GX Works 2 to GX Developer? Do you recommend me to upgrade the project to GX Works 2 instead? How will the panel react? I need to reprogram this as well. GX Developer is not the same as GX IEC Developer. I would upgrade the GX IEC Developer program to GX Works 2. The HMI panel should behave the same as it is only looking at devices D0 will be D0 in GX IEC as in GX Works 2. Thanks for quick answer. Feels better to be back in gx works 2. Though i cant seem to find where you set the option to download via usb. And since its been a year i cant find where to invert a pin. If im not wrong it was a quick keyboard command. Do you know? Google could not help. If you want to invert the pin of a FB left mouse button double click on the FB just before the pin. Perfect. That was what i was looking for. Found the transfer menu down to left. Slowly i'm warming up to gx works 2 again. Quite nice environment. One thing i am wondering though is why its such a hassle to "initialize" inputs and outputs. Does it need to be that hard? Writing some hex-number to a certain variable. What do you mean with inputs and outputs as Inputs are read from the hardware and Outputs can be set to hold their value at stop. For all other devices you can use the inial value value file. I mean the setup for which channels to use for input and output. Writing hex values, moving and setting different X and Y.
I'm just used to adding the hardware, setting addresses and all is set. If you use the special function utils. You do not have to do that. Well you have to activate a bit for each channel when using an anlog output module but that is in there for control purposes. This is also much better in GX Worsk 2 than in GX IEC Developer. I added the two modules Q64ADV and Q64DAN. But I have 4 modules, the first 2 seem to be regular modules and cannot be added with the intelligent function module. Is that right? Correct. This is an input module (X) and an output module (Y). These are not special modules just IO modulen. The default settings for these can be changed in the PLc parameters => IO assigment =>Detailed settings if you want to change the the input filter for the input module for instance. Thanks for that. I am understanding it more now. The instruction cannot process the contained data. Access error of ATA card or SD memory card occurs by SP.FREAD/SP.FWRITE instructions. A file being accessed by another function was accessed with SP.FWRITE instruction. Well most likely de values you have set for the PID init are not correct. I see the values for PID are only set when temp1 is pulsed. So they are 0 when PID is set So this is probably the problem. They have to have a minumum value of 1. So if you change the temp1 for SM402 (init pulse) your problem will be gone. Parameters were also wrong like you said by the way. Pid control gave parameter error. Until correct values were put in. Was possible to simulate though. Regarding switch settings. I think I understand it now. How is it done correctly? Any tip? Just saw it now that Channel is a local label array. Question is then, could i just expand the array and be able to take in the other analog inputs / channels? ok first of all if you register the special modules in your GX Works 2 project than you can use the selections there to set the switch settings. The channel[x] is just an Array so yes you can expand this. But there must be a FB where the analogs signals are read into the Array. Am i right in that i now do not need the networks 1-4 anymore? Can I now directly address the analog input channels to pass them on to scaling block? Yes that is correct if you set the Refresh settings. For the analog output you will still need to set the output enable flag. If you have any problems just right click the module => Register to intell function module monitor and you can see all the info direcly from the module. Oh I see you have already done that now in your screen capture. Thanks for info. Then i remove these networks. But how do I address an analog input directly? Like i did in picture 3? Regarding analog out, I believe i have enabled it. Have attached the picture. Will remove the networks 4-8 for the output also then. Thank you. I tried it yesterday without adding a label but adressed D501 directly in the scaling block. Was not able to read any value from the analog inputs. Will create a label and try again. I will have no access to the equipment for a while though. The scaling block does just that change the value. Did you set up D501 in the refresh settings? Hmm. In the IFM monitor i do get a correct signal value for channel 5. It's is somehow the transfer to D501 that i have done wrong.